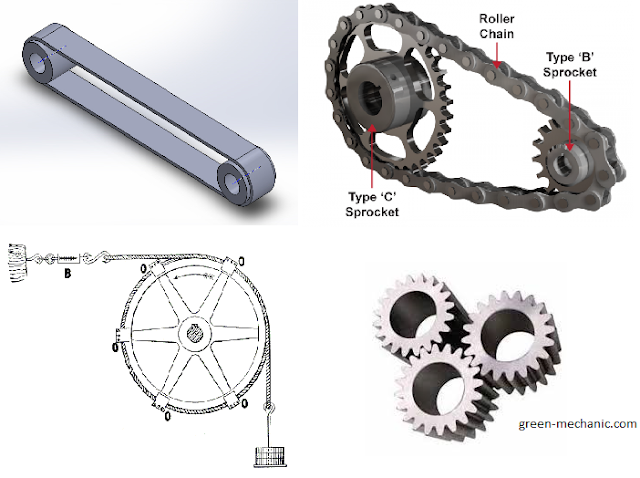 Power transmission using chain is one of most commonly used method in vehicles like bicycle and motor bike where power from motor or engine is transfer to the tires using set of chain and sprocket. Chain drives are mostly used in those applications where length between the primary mover and driving mechanism is large and weight of chain drive done not affect the system. The power or rpm value requirement at the output is fixed for chain drive power transmission system. Power transmission using ropes is one of most commonly used method is machines (in which large power is needed to transfer with light weight mechanism) where power from motor or engine is transfer to the tires using set of rope and pulleys. Rope drives are mostly used in those applications where length between the primary mover and driving mechanism is very large and weight of rope drive done not affect the system. The power or rpm value requirement at the output is not fixed (slip will not affect system) for rope drive power transmission system.